Grafting Underarm Stitches – With No Holes! So – a while ago Denny gave me the plying head from her old Lendrum (which she doesn’t have anymore). I went and ordered a jumbo bobbin from Gemini Fibres, along with a regular size bobbin (it’s walnut rather than maple, because that’s what they had). Check it out – regular on the left, jumbo on the right. Dang. See all that space at the bottom? That’s not supposed to be there – the bobbin should be flush between the two ends! I know this part is from the old Lendrum, but how big was that jumbo bobbin??! After some internal deliberation (goddammit, now I’m going to have to buy the head anyway; I’ll need to order a large drive band to make this work; this head is too damn big for the wheel) I actually put the head on the wheel, and treadled for a bit. I think I can make it work – I just need to put something there to fill up that space. That said, if anyone has a ginormous lendrum bobbin sitting around that they don’t need…I wouldn’t mind buying it off you! The body of VBC (that’s Vintage Blue Cardigan) is nearly ready to go – just need to do a ribbed band on the left front, then sewing up and the neckband. Pretty! I’ve only used eight balls of Rowan Wool Cotton so far; I’m going to have to go into a ninth ball for the band and collar, but still – safe completion within my ten-ball limit. The VBC is lovely indeed! Neat! I love the long ribbing on the cuffs, that’s going to look great. You don’t block before seaming? VBC is looking lovely. Is this from an IK issue not too long ago, but was done in pink? It’s divine. If you do end up buying the plying head, I don’t believe that you need the larger drive band – as long as the head is down close to the wheel (instead of up as high as it can go, if you know what I mean), I think you can use the bank you’ve got. Of course, most places that will sell you the plying head throw in the drive band for free with it. Also, there’s a yahoo email group for Lendrum wheel owners. http://groups.yahoo.com/group/lendrumspinners/ Perhaps you might post there asking for suggestions, or older plying bobbins? I’m in love with your blog. 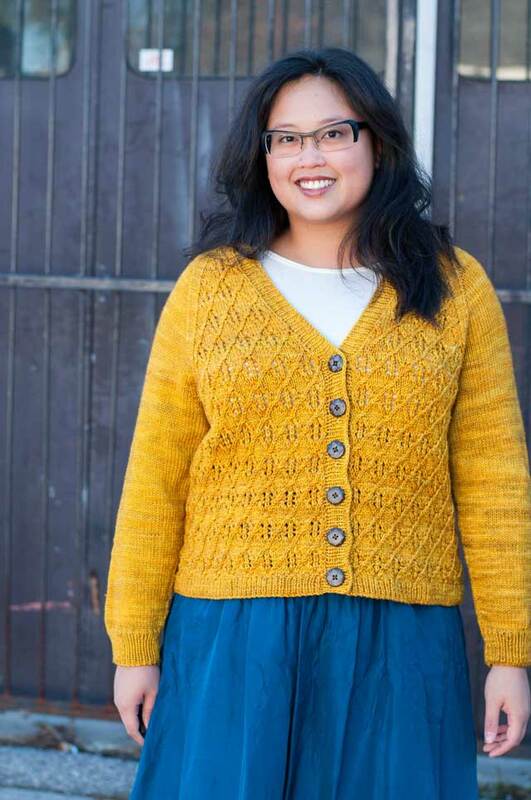 especially in love with the mini-sweater inspired cardigan. I shall link you. © 2019 Laura Chau. All Rights Reserved.